Among the most learned and profound conductors of his generation, Tito Ceccherini is highly appreciated for the extraordinary lucidity of his interpretations and the remarkable versatility of his approach to the repertoire. 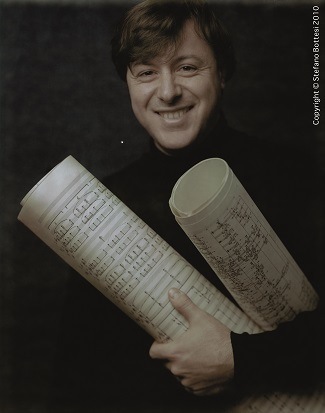 An acclaimed interpreter of the modern repertoire, he has delved into the classic works of the 20th century: from Bartók, Debussy and Ravel, to Schoenberg, Webern, Ligeti. His operatic repertoire, that also shows his penchant for the early 20th-century (Bluebeard’s Castle, From the house of the dead, Il Prigioniero, The Rake’s Progress), also testifies a deep knowledge of the Italian melodrama and a special attention to belcanto, where he has proven to be able to reconcile stylistic properties and modern sensibility. He is also appreciated in the interpretation of Mozart’s operas, and for his talent in creating new works (Sciarrino’s Da gelo a gelo and Superflumina; Fénelon’s La Cerisale at the Bolshoi and the Opéra de Paris; Hurel’s Les pigeons d’argile in Toulouse). Conductor of proven experience, he conducts major orchestras including the Orchestre Philharmonique de Radio France, Filarmonica della Scala in Milan, the BBC Symphony and Philharmonia Orchestra of London, the WDR Sinfonieorchester in Cologne, the Netherlands Radio Philharmonic, the HR-Sinfonieorchester Frankfurt, the SWR Stuttgart, the Deutsche Radio Philharmonie, the Tokyo Philharmonic, the Orchestra Sinfonica Nazionale della RAI, the Maggio Musicale Fiorentino Orchestra, the Teatro La Fenice Orchestra in Venice, the Orchestra di Milano Giuseppe Verdi, the Bilkent Symphony, the OSI in Lugano, the Real Orquesta Sinfonica of Seville, the Orchestre National de Bordeaux, the Orchestre de Chambre de Genève, and celebrated ensembles such as the Ensemble InterContemporain, Klangforum Wien, Ensemble Modern, Contrechamps, among many others. In August 2012, he made his début at the Lucerne Festival in the Pollini Perspectives cycle, with Klangforum Wien and the Neue Vocalsolisten, a project later presented in Tokyo (Suntory Hall), Paris (Salle Pleyel), Berlin (Philharmonie) and Milan (Teatro alla Scala). Also in 2012, he opened the new Festspielhaus in Erl (Austria), with a highly-praised performance of Bartók’s Duke Bluebeard’s Castle. Regular guest of the Festival d’Automne in Paris, he has been acclaimed in theatres such as the Opéra National in Paris, Bolshoi Theatre (Puccini: Turandot), Théâtre de Capitole de Toulouse (Bartók: Bluebeard’s Castle; Dallapiccola: Il Prigioniero, Berlioz: Béatrice et Bénédict, Mozart: Die Entführung aus dem Serail), Frankfurt Opera (Stravinsky: Rake’s Progress, Janaček: From the house of the dead), Grand Théâtre de Genève, Teatro La Fenice in Venice (Krenek: Cefalo e Procri, Battistelli: Riccardo III), Teatro Colón in Buenos Aires, Nationaltheater Mannheim (Donizetti: Maria Stuarda; De Majo: Alessandro), Tiroler Festspiele in Erl (Mozart: Die Zauberflöte), Opéra de Rennes (Donizetti: Don Pasquale), among others. Highlights of the upcoming engagements include the debut at the Opernhaus Zurich (Ligeti: Le Grand Macabre), the returns to the Frankfurt Opera (Bellini: I Puritani), to the Philharmonie de Paris (Haydn: Il Mondo della Luna), to the Teatro La Fenice in Venice (Sciarrino: Luci mie traditrici), as well as concerts at the Biennale of Venice with the Haydn Sinfonieorchester, and with the SWR Sinfonieorchester in Donaueshingen, Essen and Freiburg. Tito Ceccherini’s recordings (Sony, Kairos, Col legno, Stradivarius, etc) have been awarded with Choc de Monde de la Musique, Diapason d’Or and Midem Classical Awards. 2018-19 season (February 2019) – Short version for program booklets. Not to be altered without permission. Please contact us if this biography is out of date.